When Joelle Dupas falls ill, she goes to a medical centre in her home town in rural western France where all 12 doctors have come out of retirement. "You need to wait at least a year to get an appointment with an ophthalmologist," Dupas, a former secretary and salesperson, told Reuters in the waiting room. "It was not like this years ago." Although France enjoys a reputation for having one of the world's best healthcare systems, it has an ageing population and a shortage of doctors, especially in rural areas. In Laval, only one in five residents is believed to have a family doctor, according to local professionals. President Emmanuel Macron has put rural France at the heart of an overhaul of the healthcare system which he announced on September 18, promising more money and doctors for what he called "healthcare deserts" in areas outside big cities. The reforms are an important test for Macron. Success could help reverse a fall in his popularity since he was elected in May 2017, and counter leftist criticism that he is a "president of the rich". But with opinion polls showing healthcare is a priority for voters, failure could badly damage his presidency. "France obviously has good fundamentals when it comes to healthcare," said Laurent Chambaud, the director of France's School of Advanced Studies in Public Health. "But like in many other developed countries, the system, which centres around hospitals, has to reform itself to adapt to social changes." "If it doesn't do so in the next five to 10 years, the system will be totally saturated," he said. When the World Health Organisation conducted its only global healthcare survey in 2000, it rated France's system the world's best. But the ageing population, tight budgets and an increase in burnout among doctors have taken a toll. France ranked only 10th in a global study published last year by the Commonwealth Fund, a private US healthcare foundation. It had been ninth in the fund's previous report in 2014, the only other time France had been included. "We have been alerting authorities for decades and nothing has changed," said Gilles Ollivier, who serves on a regional doctors' council in Laval. "Many here live in rural areas where inhabitants, and some of them very old, find themselves in small villages where there are no shops, no post office, no schools and no doctors." Under Macron's plans, 400 doctors will be deployed to rural areas where coverage is thin. No hospitals will be closed and 4,000 medical assistants will be recruited to handle paperwork and make basic checks to free up doctors. 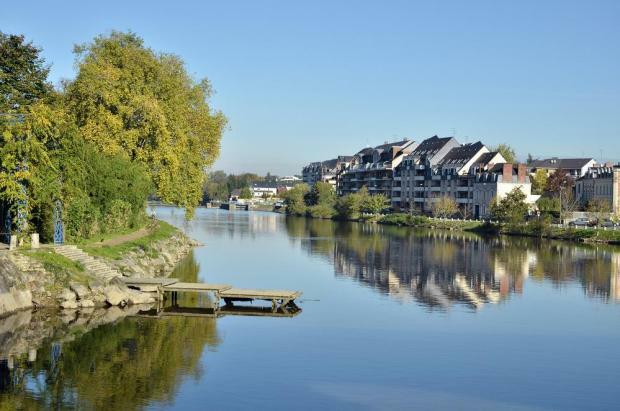 Laval, on the river Mayenne about 300km southwest of the capital Paris, is one of the communities where the fate of Macron's reforms will be played out. It also shows how big a challenge the centrist president faces. "I had been looking for a family doctor for years but every time I was turned down because they said general practices couldn't take new patients," Fatou Diaby, 30, said in the SMP's waiting room with her two young daughters. "When I last became pregnant, I had nobody to go to except hospital emergencies, which are always packed. Here someone listens." Laval's 12-storey hospital, built in 1974, has more than 1,000 beds and admits 40,000 patients a year but has too few doctors. A lack of funds means some patients summon nurses with old-fashioned handbells. "It is true that we are experiencing some kind of depression," said Andre-Gwenael Pors, the hospital's director, citing understaffing, budget constraints and a proliferation of regulations in recent years. Olivier Guihery, a general practitioner who divides his time between a Laval practice and several retirement homes, said he and his colleagues sometimes work 100 hours a week with little or no time for rest or holidays. It is so tough they call it "war-zone" medicine. "We are on the verge of burning out all the time but we have no choice but to continue," he said. Doctors who spoke to Reuters welcomed Macron's plans to overhaul the system but also had concerns. Pors said the reforms needed to be spelled out in more detail. Ollivier, the representative of the regional doctors' council, was wary about the recruitment of medical assistants for basic tasks. "Getting help with the paperwork is great but do we really want these assistants to take blood pressure or body temperature, like in Britain? These are highly sensitive human actions," Ollivier said. "Many of us are sceptical. We feel like all these decisions are taken in cities and offices, away from the reality of rural areas."